The reality of this has been a wild ride and I am still look at the circumstances of this adventure with a smile and incredulity. The very fact that I am a fishing coach period is quite a story.... but let's stick with the origin of the show. It started as our fishing team met Brent Chapman as I was a part of his season 2 of Pro Vs Joe ( Coach Em Up ) in 2017 . 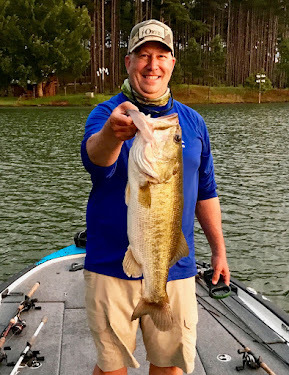 We challenged Brent and he was familiar with that special lake in Louisville, AL. Getting to see a high quality show up close for filming was a beginning of this process. We loved getting to meet Brent, his family, and his amazing film crew. But again, it was fun to be a part of that- but I would not have EVER thought I was interested in doing ANYTHING like that. In fact, I was super impressed with how hard it is to do! Meeting Brent was a special time and it resulted in 3 more episodes of his show : One with Jack Flemming, one with Grayson Morris, and one with Aaron and Jordan Martens. But the process was ahead.....It takes A LOT of time and planning to do a show right. And that doesn't count the equipment expense! I also have to link conversations I had with Coach David Cutcliffe, Brent Chapman producers Anthony Crivelli, and Tom Leogrande- and Montgomery, AL sports promoter, Doyle Powell all together about current culture, training young people, and how hard it is to target teens with messaging. Each conversation put some thoughts in my mind of how I can get better as a coach and help elevate our fishing program. Doyle Powell called me about joining Jimmy for filming in Feb. of this year. We had an amazing time and Jimmy Houston is such an inspirational person. The guy still has such great passion for fishing and he understands it as a calling on his life. That calling drives him to be an instructor and mentor of this sport he loves. Our similarities were not fishing as much as it is for educating and mentoring young people. 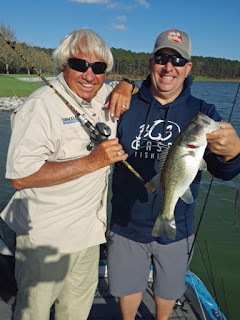 As we fished and filmed, we also talked about how to connect with teens- who really watch their peers on you tube more than connecting with a high profile 'star'. Pat Turner, Jimmy Houston Outdoors producer, and I had a lengthy conversation about their network and his desire to create content to help young anglers. The more we talked, the more I thought 'I don't know HOW I can pull this together, but we can do it." When I got back to BCS in Feb, I talked with Coach Matthew Forester, the head of our school media class. Coach Forester and I had already been working together to use the creativity of his students to produce original content and graphics for our athletic programs. The difficulty in producing our own show started with equipment- the quality we would want to produce wasn't gong to be cheap- so we put together a 'wish list' of audio, video, and editing needs. The entire package was about $20,000. So immediately, the Lord was going to have to provide before we could even think about it. We have GREAT anglers at BCS. These guys have worked hard to become great. 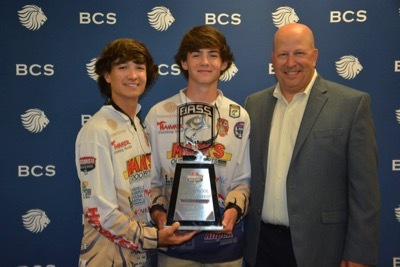 But I also know that our area in Birmingham has some high school HAMMERS when it comes to competitive bass fishing- so I knew that I had to involve these students as well. That has been my favorite part of 'Winning Edges"- being around some amazing kids at other schools. High School fishing in Alabama is pretty cool- competitive? YES- but there is also a friendship between anglers at other schools. Even the college guys help the high school guys. We have a GREAT SPIRIT in fishing right now.... if I can get some of the parents to join us, it would be the healthiest competition I have ever been a part of. 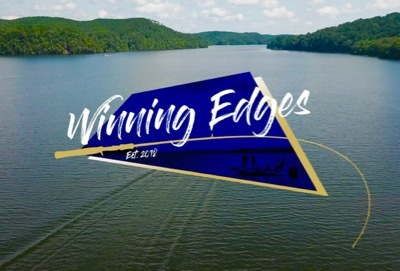 The main mission of 'Winning Edges' is 'hands on' educational and inspirational video content. It provides an opportunity for our students to be creative and LEARN. It is as much video training as it is fishing training. 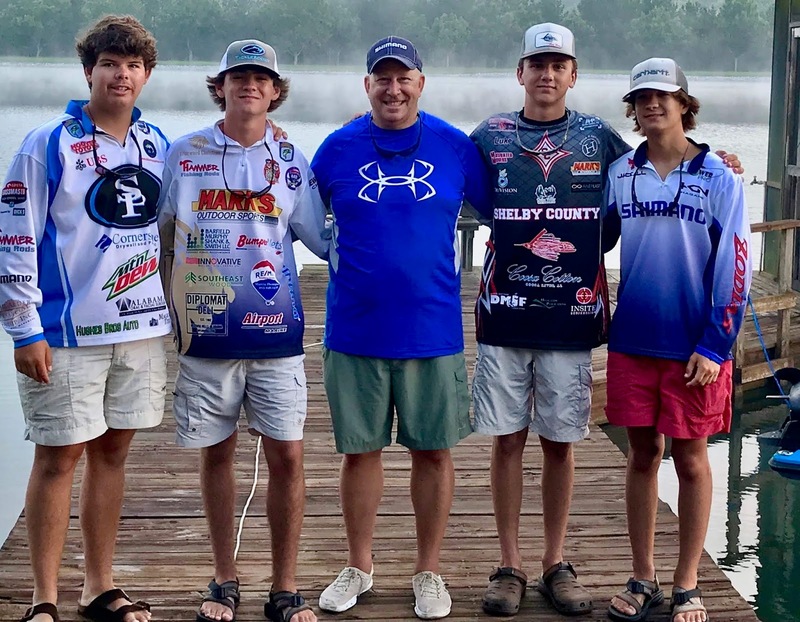 It helps us to showcase WHAT IS GREAT about high school fishing- God, Country, Fishing...and the relationships between schools is very healthy. Watching these guys compete, but also SUPPORT one another is impressive. 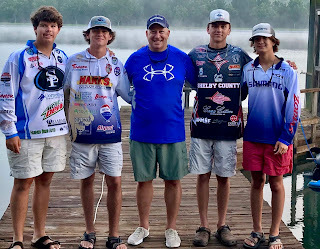 We also have great support from college anglers who are teaching and training the high school guys as well. High school, college, and professional fishing is a very positive thing in our country today! Nothing is perfect of course, but we could not be happier with the support of some great pros like Aaron Martens, Randy Howell, and Brent Chapman along the way. Also, the manufacturers are starting to realize it is possible to market to this generation by jumping into social media using the young guys as representatives. So we started... we travelled to Pickwick, Logan, Caroline, and Lay Lake with student film crews. I did start to get donations and we just went with it. We had audio issues, camera shaking issues, and we were filming in the summer during VERY TOUGH conditions. When we downloaded the hours of b-roll and digital sound... we all went "OH BOY!" But Coach Forester never wavered, we split the students up into editing 'teams' and just had the guys " Here is your show- get going!". The result was cool- each episode has its own look and feel. I am very pleased with the outcome- you can tell a difference in the early shows and the last ones- we are all getting better. We filmed a lot in the summer, so we haven't gotten in a variety of techniques...but our plan is to film a minimum of 2 shows each fishing season (fall, winter, spring, and summer). 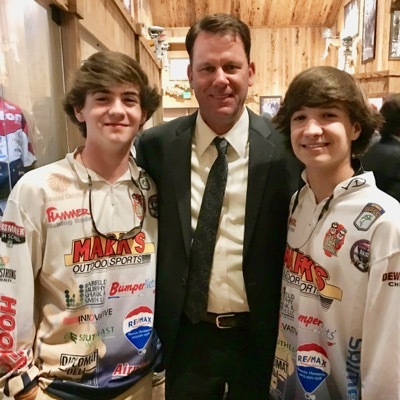 When Grayson Morris and Tucker Smith won the natty with JT Russell as their boat captain, it was super special.... AND all of a sudden...Wining Edges was going to have a chance to have a larger impact. This was evident this past week where we were hosted by Shimano at the Bass Hall of Fame in Springfield, MO. 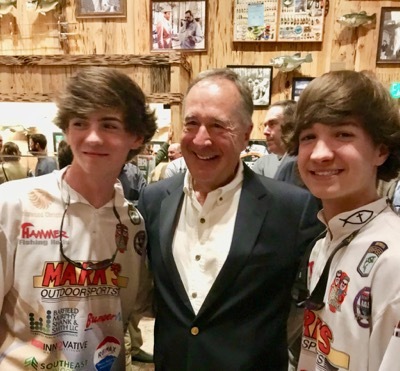 Our guys were introduced to major leaders and personalities in the world of fishing. I was able to talk a lot about Winning Edges and solicit advice about the project. 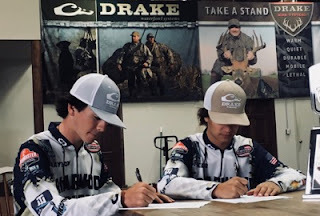 It also helps that Grayson and Tucker stopped at Drake of the way home and signed an apparel agreement with Drake Performance Fishing. 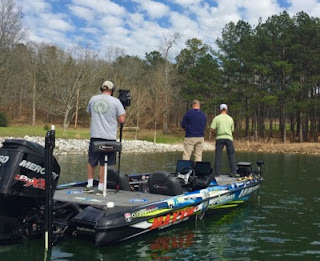 We will be filming new shows featuring Shimano and Drake soon.